Smartsheet Dashboards – helping you surface the right information at the right time, so you can make better decisions faster. 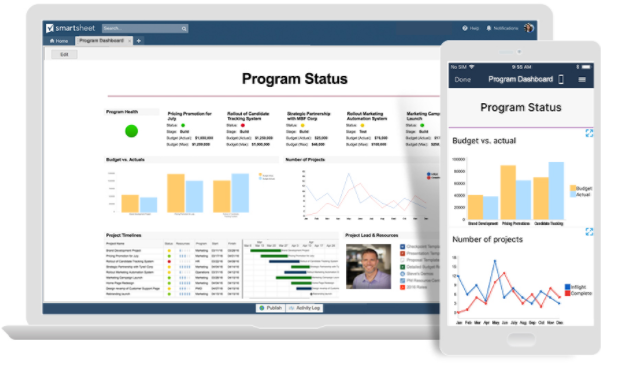 We’re excited to announce Smartsheet’s new dashboards (previously known as Sights™) to go along with Smartsheet’s updated look and feel. In addition to all of the capabilities you have had with Sights up until today, we’ve added the ability to create charts based on your Smartsheet data to our dashboards. While you need a Business or Enterprise license to create and edit dashboards, anyone can access dashboards that are shared with them or published, whether or not they have a Smartsheet license. 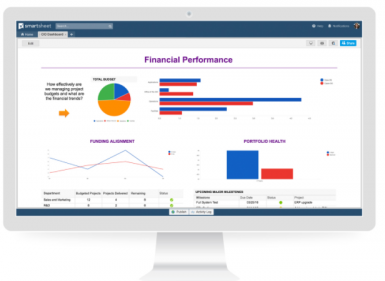 Dashboards are designed to give you and your stakeholders real-time visibility into work progress. Since your work is unique, you don’t need to conform to pre-built dashboards. You can fully customize your dashboards through simple, easy-to-use widgets that look great on desktop or mobile, without needing any help from IT or having to learn how to code. Widgets can pull real-time data from where you store and track information. Are you tracking projects in a sheet? Add a link to the sheet or an icon that links back to a sheet. Just want to show select data points from a sheet? Use the metric widget to show information from individual cells. Need to embed a report showing the latest status across initiatives? There’s no need to do extra work — simply add the report widget. You can also add rich text, titles, attach files, and display images to give others the context they need to understand your information. The best part is that once you build your dashboard, it’s always up-to-date. You don’t need to constantly maintain it or manually enter the latest metrics into your dashboard, since your widgets are pulling directly from your data sources. Visual representations of data can help you cut through the noise and quickly spot trends in your business. That’s why we’re giving you the ability to chart your Smartsheet data in our new dashboards. Using a simple widget, you can select from four familiar chart types: bar, column, line and pie. These charts pull real-time data from sheets, so you can analyze progress at a glance and quickly take action. Whether you’re a CIO in need of executive-level insights, a sales manager looking to share pipeline activities, or a program manager wanting to share high-level status information, dashboards are designed for you. CIOs who use dashboards always know the health of their portfolio. They get accurate, real-time views of their entire portfolio. They can compare current spend on strategic objectives, track budget vs. actuals, see project status, and more — all in one place. 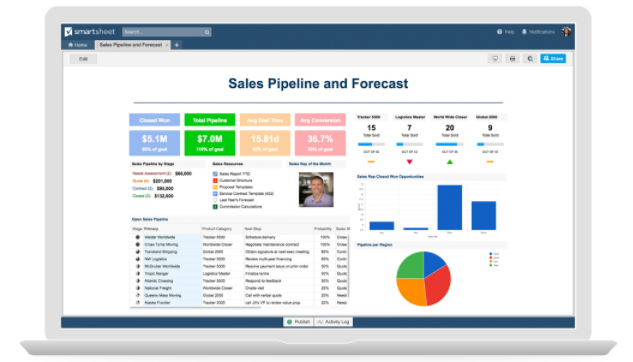 Sales managers who use dashboards know exactly what their pipeline looks like. They can easily move from high-level overviews into the details. Pipeline activity, deal status, and key metrics are never more than a click away. 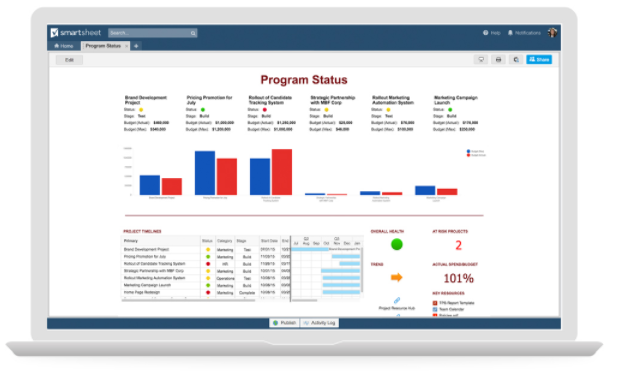 Program managers who use dashboards effortlessly stay on top of their overall program status. They have visibility into every aspect of their project portfolio, from key project metrics and status information, to supporting documentation. No matter what your role in an organization, our easily-configurable dashboards give you the right information at the time, so that you know what you need to know to make better decisions without having to track down relevant data. Here’s a look at how dashboards can help your organization increase visibility into real-time information, spot emerging trends, and quickly act on data — all without help from IT. For more information on how to add a chart to your dashboard, read our help article. Dashboards are available to Smartsheet customers on Business or eligible Enterprise plans. If you’re on a Team or Individual plan and interested in upgrading your plan, contact our team today.